This quick reference sheet was provided by the U.S. Patent and Trademark Office in December of 2014 to summarize the office's 2014 Interim Guidance on Patent Subject Matter Eligibility document (original PDF). This quick reference sheet provides a summary of the attached guidance document entitled 2014 Interim Guidance on Patent Subject Matter Eligibility (Interim Eligibility Guidance). 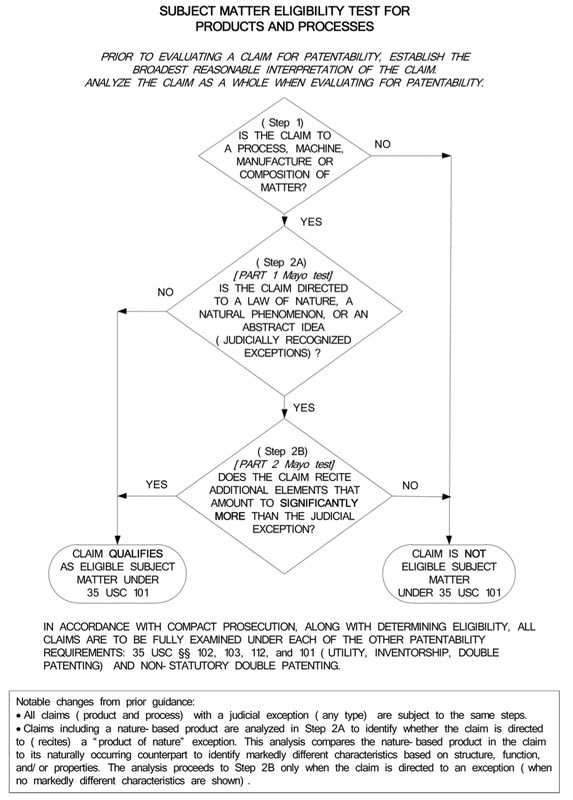 As explained in detail in the Interim Eligibility Guidance, the attached flowchart illustrates the subject matter eligibility analysis for all claims (i.e., machine, composition of matter, manufacture and process claims). This analysis is to be used during examination for evaluating whether a claim is drawn to patent-eligible subject matter. Step 1 is represented in diamond (1), and determines whether the claim is directed to a process, machine, manufacture, or composition of matter. This step has not changed and is explained in MPEP 2106(I). If the claim is not directed to one of these statutory categories, reject the claim under 35 U.S.C. § 101 as being drawn to non- statutory subject matter, using revised form paragraphs 7.05 and 7.05.01, and continue examination for patentability. If the claim is directed to a statutory category, proceed to Step 2. Step 2 is the two-part analysis from Alice Corp. (also called the Mayo test) for claims directed to laws of nature, natural phenomena, and abstract ideas (the judicially recognized exceptions). This step is represented in diamonds (2A) and (2B) and is the subject of the Interim Eligibility Guidance. In Step 2A, determine whether the claim is directed to a law of nature, a natural phenomenon, or an abstract idea (judicial exceptions). If no, the claim is eligible and examination should continue for patentability. If yes, proceed to Step 2B to analyze whether the claim as a whole amounts to significantly more than the exception. “Directed to” means the exception is recited in the claim, i.e., the claim sets forth or describes the exception. See Part I.A.1 of the Interim Eligibility Guidance. If the claim when viewed as a whole clearly does not seek to “tie up” any judicial exception, use the “streamlined analysis” discussed in Part I.B.3 of the Interim Eligibility Guidance. Examples of the types of concepts that the courts have found to be laws of nature, natural phenomena, or abstract ideas are provided in Parts I.A.2 and IV of the Interim Eligibility Guidance. If the claim recites a nature-based product limitation, the markedly different characteristics analysis is used to evaluate whether the claim is directed to a “product of nature” that falls under the law of nature and natural phenomenon exceptions. To determine whether the markedly different characteristics analysis is needed, and how to perform this analysis, see Part I.A.3 of the Interim Eligibility Guidance. In Step 2B, determine whether any element, or combination of elements, in the claim is sufficient to ensure that the claim as a whole amounts to significantly more than the judicial exception. If no, the claim is ineligible, and should be rejected under 35 U.S.C. § 101 as being drawn to ineligible subject matter, using form paragraphs 7.05 [revised] and 7.05.015 [new]. If yes, the claim is eligible. In either case, examination should continue for patentability. The additional elements should be considered both individually and as an ordered combination. Individual elements when viewed on their own may not appear to add significantly more, but when viewed in combination may amount to significantly more than the exception. The Supreme Court has identified a number of considerations for determining whether a claim with additional elements amounts to significantly more than the judicial exception itself. Examples of these considerations, and how they are applied, are provided in Parts I.B.1 and III of the Interim Eligibility Guidance. Consider each claim separately based on the particular elements recited therein – claims do not automatically rise or fall with similar claims in an application. If a claim is directed to a plurality of exceptions, conduct the eligibility analysis for one of the exceptions. Additional elements that satisfy Step 2B for one exception will likely satisfy Step 2B for all exceptions in a claim. On the other hand, if the claim fails under Step 2B for one exception, the claim is ineligible, and no further eligibility analysis is needed. Examiner Note: (1) This form paragraph must be preceded by form paragraph 7.04.01 in first actions and final rejections. (2) This form paragraph must be followed by a detailed explanation of the grounds of rejection using one or more of form paragraphs - 7.05.01, 7.05.015, 7.05.02, 7.05.03, or another appropriate reason. (3) See MPEP §§ 706.03(a) and 2105 - 2107.03 for additional guidance. Examiner Note: (1) This form paragraph should be preceded by form paragraph 7.05. (2) In bracket 1, explain why the claimed invention is not patent eligible subject matter by identifying what the claim(s) is/are directed to and explain why it does not fall within at least one of the four categories of patent eligible subject matter recited in 35 U.S.C. 101 (process, machine, manufacture, or composition of matter), e.g., the claim(s) is/are directed to a signal per se, mere information in the form of data, a contract between two parties, or a human being (see MPEP § 2106, subsection I). (3) For a claim that is directed to a judicial exception (i.e., a law of nature, a natural phenomenon, or an abstract idea) and is non-statutory, use form paragraph 7.05.015. Examiner Note: (1) This form paragraph should be preceded by form paragraph 7.05. (2) This form paragraph is for use with all claims, including product (machine, manufacture, and composition of matter) and process claims, and for any type of judicial exception. (3) In bracket 1, identify the claim or claims that recite the judicial exception. (4) In bracket 2, identify the exception by referring to how it is recited (set forth or described) in the claim and explain why it is considered an exception. For example, “the Arrhenius equation, which is a law of nature in the form of a mathematical algorithm” or “the series of steps instructing how to hedge risk, which is a fundamental economic practice and thus an abstract idea.” For products of nature, explain how the characteristics are not markedly different from the product’s naturally occurring counterpart in its natural state. For example, “the naturally occurring DNA segment, which is not markedly different from its naturally occurring counterpart because it conveys the same genetic information.” Provide additional explanation regarding the exception and how it has been identified when appropriate. (5) In bracket 3, identify the additional elements and explain why, when considered separately and in combination, they do not add significantly more to the exception. For example, if the claim is directed to an abstract idea with additional generic computer elements explain that the generically recited computer elements do not add a meaningful limitation to the abstract idea because they would be routine in any computer implementation, or if the claim is directed to a method of using a naturally occurring correlation explain that steps for routine data gathering in order to test for the correlation do not add a meaningful limitation to the method as they would be routinely used by those of ordinary skill in the art in order to apply the correlation.